France money 500 French Francs Blaise Pascal banknote of 1991, issued by the Bank of France - Banque de France. French banknotes, French paper money, French bank notes, France banknotes, France paper money, France bank notes, collection of French paper money, Billets de banque en franc français, collection de papier-monnaie billets français, Les billets de la Banque de France, Papier monnaie - Billets France. Euro exchange rate: 500 French francs are the equivalent of 76 euros 22 euro cents (fixed rate of 6.55957 francs for 1 euro). Obverse: A portrait of Pascal appears on both sides of the note with Gothic Flamboyant bell tower of the Church of Saint Jacques de la Boucherie ("Saint James of the butchery") in Paris at bottom right the and the Clermont-Ferrand Cathedral in the background. 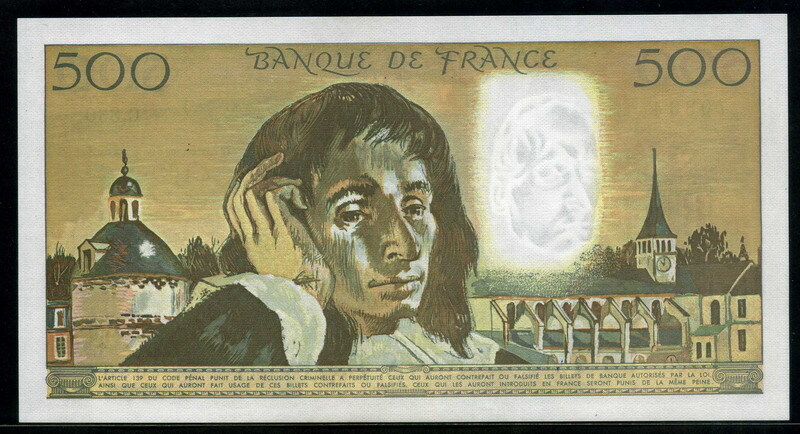 Reverse: At center, the same Portrait of Blaise Pascal identically framed on both sides of the banknote by a colombier of Abbey of Port Royal, Paris and the Chapel of the Abbey, where Pascal retired in 1655 and gave a lecture in 1658 in terms of his work "Apologie" (Apology of the Christian Religion). Watermark: Death mask of Blaise Pascal. The dimensions are 180 mm x 97 mm. The dominant colors are yellow and brown. The banknote design was created by Lucien Fontanarosa (1912-1975) and the engraving by Claude and Robert Armanelli Durrens. 500 French francs bank note Pascal was created on 4 January 1968 and January 7, 1969 issued into circulation by the Bank of France for replacing the 500 francs Molière . It was replaced in 1995 by the 500 francs Pierre et Marie Curie . 500 francs Pascal is the highest part of banknotes issued by the Banque de France, it was printed from 1968 to 1994 and remained in circulation until 1997. 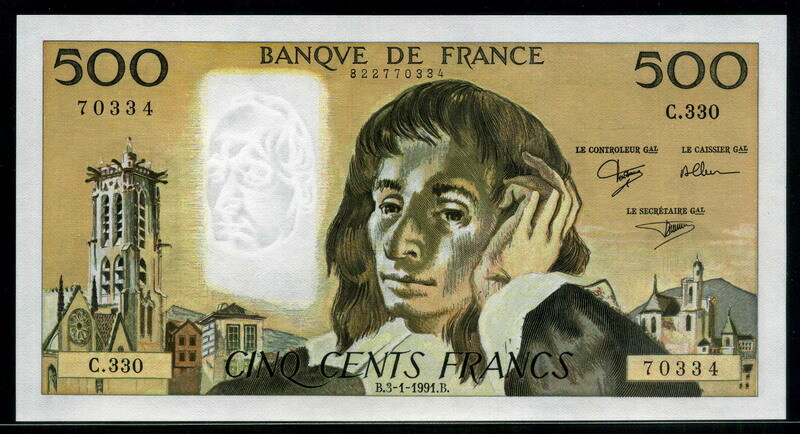 500 francs Pascal note was redeemable at the Banque de France until February 28, 2007. Blaise Pascal (19 June 1623 – 19 August 1662) was a French mathematician, physicist, inventor, writer and Christian philosopher. He was a child prodigy who was educated by his father, a tax collector in Rouen. Pascal's earliest work was in the natural and applied sciences where he made important contributions to the study of fluids, and clarified the concepts of pressure and vacuum by generalizing the work of Evangelista Torricelli. Pascal also wrote in defense of the scientific method. In 1642, while still a teenager, he started some pioneering work on calculating machines. After three years of effort and fifty prototypes, he invented the mechanical calculator. He built 20 of these machines (called Pascal's calculators and later Pascalines) in the following ten years. Pascal was an important mathematician, helping create two major new areas of research: he wrote a significant treatise on the subject of projective geometry at the age of 16, and later corresponded with Pierre de Fermat on probability theory, strongly influencing the development of modern economics and social science. Following Galileo and Torricelli, in 1646 he refuted Aristotle's followers who insisted that nature abhors a vacuum. Pascal's results caused many disputes before being accepted. Saint-Jacques Tower (Tour Saint-Jacques) is a monument located in the 4th arrondissement of Paris, France, on Rue de Rivoli at Rue Nicolas Flamel. This 52-metre (171 ft) Flamboyant Gothic tower is all that remains of the former 16th-century Church of Saint-Jacques-de-la-Boucherie ("Saint James of the butchery"), which was leveled shortly after the French Revolution. Clermont-Ferrand Cathedral (Cathédrale Notre-Dame-de-l'Assomption de Clermont-Ferrand) is a Gothic cathedral, and French national monument, located in the town of Clermont-Ferrand in the Auvergne. It is the seat of the Archbishops of Clermont (bishops until 2002). It is built entirely in black lava stone, which makes it highly distinctive, and visible from a great distance. Its twin spires are 96.2 metres tall, and tower above the town's rooftops. Port-Royal Abbey was an abbey in Paris that was a stronghold of Jansenism. It was first built in 1626 to relieve pressure of numbers on the mother house at Port-Royal-des-Champs.